Imagine a wearable that could keep an eye on you or someone you cared about without looking like an awkward plastic button. Maybe this device doesn't have the unnecessary frills of a smartwatch but it still looks like one, and instead provides a different kind of function, one that makes sure its medical grade sensors keep your heart in check. There are several wearables trying to target an older demographic but what we're describing is the iBeat, a 24/7 heart rate monitor from a company of the same name. It may be tough to sell this kind of a device, but iBeat's CEO Ryan Howard is determined to focus on a fashionable and functional piece of tech that he says could save lives. This, according to Howard, is the key behind iBeat and what sets it apart from the noise of other wearables. But it's going to take some time and more testing to get right. Last year Howard left Practice Fusion, an electronic health record company, after a ten year stint, and formed iBeat with a handful of ex-Practice Fusion colleagues. With the combined knowledge of the healthcare and digital healthcare industry, Howard feels iBeat has all the talent it needs to succeed. Drawing from his experience with a friend who passed away in his sleep, Howard decided to take preventative action for others in the same situation. "My mortality is something I think about – I'm 41 and falling asleep and not waking up is something that concerns me," he said. "So when that happened [Howard's friend's death], he was only 40 years old. It was early. "If you're 50, 60 or 65, you see it more often but when you're 40, you don't really see someone die unless it's a car crash or drug overdose – something like that. But seeing someone die of a natural condition, like a heart related condition at 40 years old, that definitely was jolting. That was really the genesis of the idea." The device itself has a simple enough premise: to make sure you're alive. The current first version the company is planning is essentially a real time monitoring device, or 24/7 monitoring of an individual. Howard says its always-on ability is to literally make sure you have a pulse. "What it's doing is it detects cardiac arrest, it detects a heart stopping or any type of erratic behavior, in real time. What it's doing is it's engaging behaviour – if I'm wearing it, it will say, 'Hey Ryan, are you okay?' I put yes or no and if I don't respond within five seconds then it's fully autonomous, fully cellular and doesn't need a phone or need to be connected to a radio or landline. I can be inside or out and about, we have two networks that we work with. It sends data out to a cloud based system where we call the user in real time. "Within seconds of heart rate declining significantly, or stopping altogether, we have engaged the user. Looking for a false positive, we call the user as well, and if there's no response at that point, what we do in tandem is reach out to EMT's and notify emergency contacts." The device is also location-aware, thanks to built-in GPS, meaning both the EMT's and emergency contacts are sent a location too. Friends and family receive a text of a dispatch notice with the date of the incident, what EMT's believe is wrong, who has been dispatched and what hospital the person has been routed to. It's not exactly a wearable for the 20s or 30s crowd and Howard knows this. iBeat isn't for the elderly demographic either though. Rather it's a set of people in between, parents of the 20 and 30 somethings who don't entirely need, know or care about fancier smartwatches. "You can see there's definitely some overlap with a traditional Life Alert but it's really Life Alert for the masses. We're definitely targeting a boomer market, like a 50-70 market. So it's not people who are geriatric and it's not people who've already had an incident. "Those other guys are really focused on people who've already fallen and preventing it from happening again. [iBeat] is different because it's a younger demographic. It's more stylish, if you're wearing it, it's not a dog collar. It doesn't brand you as elderly or old or sick. It's covert, it's clean and it has sensor technology that's running passively, and professionally as well as cellular technology." iBeat isn't gunning for a place above Apple or Samsung. Rather, it's focusing on saving lives and making sure the product works well while looking like a fashionable watch. Ammunition Group, which is run by Jony Ive's predecessor Robert Brunner, has a team working on the wearable's design so it will look just as classy as a Moto 360 or Gear S2. "Stylistically the brand will be consumer based," said Howard. "What we're doing is a medical device but it won't be branded as one. That will allow it to enter the market and allow people to understand it better." Though it will look like smartwatch, it won't come with the same features. Anything additional – like notifications, fitness and more – are distractions in the eyes of iBeat. "The device itself has the ability to do a number of different things. We have an accelerometer, core processor, colour LCD – can it do the entire spectrum? Could we do step tracking, or other smartwatch functionalities? Absolutely. "I think that the core focus is to save lives so that's our mission. We are focused on first thing's first; when I look at the Apple Watch, and not to knock it but, it hasn't really been a home run for them. It doesn't really do a whole lot. It doesn't have a killer app. "A lot of the population is at risk and we want to do it well. If you're going through the watch and sifting through a calculator and other stuff, that's going to be problematic. We want to preserve the core use case to make sure that any additional click or swipe or convoluted interaction won't slow the user's ability to get help in time." So iBeat isn't trying to replace your fitness tracker either. With the recent Fitbit court woes, it's not difficult to feel cautious about heart rate monitors on the wrist. However, Howard says there's a clear distinction between iBeat and the Fitbits of the world. "First and foremost, I would argue, we have a higher end sensor. Two, Fitbit's noise is around exercising. Everyone's real pushback is around accuracy but it's not just accuracy, it's accuracy when exercising. It (heart rate) seems to be different from exercise to exercise. That's not really our goal. Telling you you're doing 89bpm is not the goal of the device. "There's more to it than that and it's not precision during exercise. It's not how we've optimised the device. We've effectively optimised it for an older, active group, or non-active, and it's for going through the day to day activities: 'Are they alive, is it consistent, can we get a pulse on them?' The precision throughout the day is more important versus the precision during exercise." 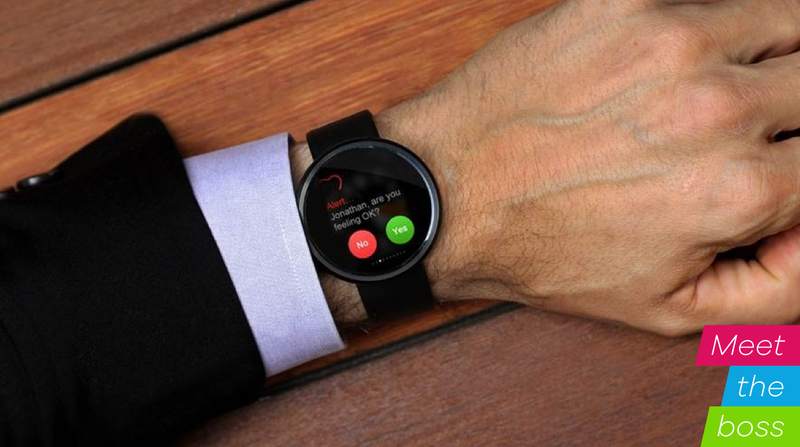 iBeat isn't planning on a fully functional smartwatch – yet. But the future of its wearable is set to evolve and grow as the company receives feedback. Howard says anything is possible and while the team is laser focused on delivering a very specific product right now, it is open to other possibilities if they're the right fit. "When you release a product, the user gives such dramatic input so quickly, it changes your entire roadmap. It shifts the entire paradigm. I'm guessing on day one, users will want step tracking – that just seems like really obvious; sedentary reminders, things like that. It could go that way. The sky's the limit but the saving lives use case is really critical for us. "The device will evolve. The current data we're gathering will allow us to predict more diagnoses over the next year or so. It will be more valuable over time, it's not going to be a one-trick pony. Our core expertise is data and data processing around specific diagnoses and we're really excited about putting the data to work in a neural network for machine learning." iBeat is planning to start crowdfunding this autumn, followed by a Q1 release in the US next year. Because there's 24/7 monitoring there will be a monthly fee tacked on to the initial $200 cost but Howard notes that this will be well under $20. If the wearable can make sure you're still alive and kicking at all times, that doesn't seem a steep price to pay.